The Obama administration is preparing to issue consumer protection regulations that will force Republicans to choose between their Wall Street allies and the Seventh Amendment right to a jury trial in civil cases. Republicans will be tempted to denounce the new rules as yet another example of this president’s customary imperial overreach, but on this issue, they should stop and take a second look. The problem is called forced arbitration, and if you’ve ever taken the time to read a consumer service contract or end-user license agreement before signing it (which makes you an admirable human being, and very rare), you’ll almost certainly have seen a clause that revokes your right to go to court in case of a breach of the agreement by the corporation. Such clauses are found everywhere, from credit cards and checking accounts to cable TV and car rentals. When you sign, you agree to accept the decision of a private, for-hire arbitrator. Unfortunately, the arbitrator is usually hired by the same company that breached the agreement and is not legally required to follow statutory or common law precedents. Its decisions are almost impossible to appeal. Most consumers have no idea that’s what they’re agreeing to. Enter the Consumer Financial Protection Bureau, which has been authorized by Congress to step in to study this problem and, based on its findings, restore Americans’ ability to hold financial institutions accountable. Under the Dodd-Frank Act of 2010, the bureau is authorized to issue regulations that limit or ban the use of forced arbitration in consumer financial services and products. Regulations to do just that are expected to be promulgated sometime this year. The regulations may turn out to be poorly framed or excessive – we’re talking about the same administration that gave us Lois Lerner and executive amnesty, after all – but the problem Congress wanted the agency to address is real. Recently, while traveling to Topeka on business, I needed to rent a car. I stopped at the Thrifty counter at the Kansas City airport. While filling out the usual paperwork, I asked the gentleman behind the counter, “What happens if I don’t check this box that says I waive my right to sue?” He blinked at me uncomprehendingly for a moment and then replied, “Um, it means you don’t get the car.” I checked the box, disgusted. My destination was 80 miles away, I was in a hurry, and I didn’t have time to haggle or shop around with Thrifty’s competitors, all of whom undoubtedly have the same policy. Today, a big company like Thrifty can effectively insist that we waive our Seventh Amendment rights on a “take it or leave it” basis; and market forces are not sufficient to police the problem. We’re stuck. And it isn’t just car rentals. When you buy a hair dryer or click “I agree” to a software download, you’re probably forfeiting your right to go to court. Statistics show that, more often than not, the arbitrator hired by the company you’re disputing with will rule in the company’s favor, likely because he’s eager to be hired again by that company in the future. Even consumers who think they understand what they’re signing usually have no clear idea of how arbitration really works. They mistakenly equate it with mediation or some other court-like procedure. In reality, forced arbitration is conducted in secret and lacks the procedural safeguards that allow consumers to prove their case. Arbitrators typically keep their reasoning private, making it hard for the losing party to know why he lost, and results are rarely published, making it difficult for similarly situated parties to know they’re entitled to relief. To be sure, arbitration can be a great option when it’s voluntarily agreed to by both parties after a dispute has arisen, but to be truly voluntary, all parties need to be free to say no. In the case of consumer financial services and products (the kinds of agreements the Consumer Financial Protection Bureau is authorized to regulate), most individual consumers have no bargaining power, as anyone who’s tried to negotiate with his credit card company can attest. Voluntary arbitration agreements have always been lawful, but up until the 1920s pre-dispute arbitration clauses like the one I had to sign at Thrifty were rarely enforced by American courts. Americans have long cherished the common-law right to a jury trial in civil cases. Indeed, preserving that right was one of the top demands of the Antifederalist skeptics of the proposed Constitution, and the Seventh Amendment was ratified precisely to preserve that ancient right in the courts of the newly constituted federal government. So in disputes between individual Americans and big companies, the Seventh Amendment has become Swiss cheese, and with more holes than cheese. Many genuinely aggrieved consumers are being denied access to the civil justice system. How can we fix this? The Supreme Court should reverse its errors, and Congress should amend the Federal Arbitration Act to ensure agreements are truly voluntary. (A bill to do that, dubbed the Arbitration Fairness Act, has been introduced in recent Congresses, but has gone nowhere, thanks to fierce opposition by the U.S. Chamber of Commerce.) Realistically, in the near term, the Consumer Financial Protection Bureau’s forthcoming Dodd-Frank regulations are the best hope consumers have for relief. But that only applies to consumer financial services and products. So there’s no avoiding a legislative remedy. This issue should be a no-brainer for conservatives. Ending the un-American practice of forced arbitration should be on the agenda, not just of traditional consumer advocates, but of everyone who loves liberty and the Bill of Rights. As a freedom issue, it’s right up there with things like repealing health care mandates, allowing cell-phone unlocking, ending corporate subsidies and eliminating cronyist tax breaks. In the last few years, it’s become increasingly clear that food companies engineer hyperprocessed foods in ways precisely geared to most appeal to our tastes. This technologically advanced engineering is done, of course, with the goal of maximizing profits, regardless of the effects of the resulting foods on consumer health, natural resources, the environment or anything else. But the issues go way beyond food, as the City University of New York professor Nicholas Freudenberg discusses in his new book, “Lethal but Legal: Corporations, Consumption, and Protecting Public Health.” Freudenberg’s case is that the food industry is but one example of the threat to public health posed by what he calls “the corporate consumption complex,” an alliance of corporations, banks, marketers and others that essentially promote and benefit from unhealthy lifestyles. It sounds creepy; it is creepy. But it’s also plain to see. Yes, it’s unlikely there’s a cabal that sits down and asks, “How can we kill more kids tomorrow?” But Freudenberg details how six industries — food and beverage, tobacco, alcohol, firearms, pharmaceutical and automotive — use pretty much the same playbook to defend the sales of health-threatening products. This playbook, largely developed by the tobacco industry, disregards human health and poses greater threats to our existence than any communicable disease you can name. All of these industries work hard to defend our “right” — to smoke, feed our children junk, carry handguns and so on — as matters of choice, freedom and responsibility. Their unified line is that anything that restricts those “rights” is un-American. The problems are clear, but grouping these industries gives us a better way to look at the struggle of consumers, of ordinary people, to regain the upper hand. The issues of auto and gun safety, of drug, alcohol and tobacco addiction, and of hyperconsumption of unhealthy food are not as distinct as we’ve long believed; really, they’re quite similar. For example, the argument for protecting people against marketers of junk food relies in part on the fact that antismoking regulations and seatbelt laws were initially attacked as robbing us of choice; now we know they’re lifesavers. Redefining the argument may help us find strategies that can actually bring about change. The turning point in the tobacco wars was when the question changed from the industry’s — “Do people have the right to smoke?” — to that of public health: “Do people have the right to breathe clean air?” Note that both questions are legitimate, but if you address the first (to which the answer is of course “yes”) without asking the second (to which the answer is of course also “yes”) you miss an opportunity to convert the answer from one that leads to greater industry profits to one that has literally cut smoking rates in half. When it comes to media, bigger is not better. And when it comes to the control of the infrastructure of how we communicate now, the trend toward extreme bigness—as illustrated by Comcast’s plan to buy Time Warner Cable and create an unprecedented cable combine—is accelerating at a dangerous pace. In the aftermath of a federal court decision striking down net neutrality protections that were developed to maintain an open and freewheeling discourse on the Internet, and with journalism threatened at every turn by cuts and closures, the idea of merging Comcast and Time Warner poses a threat that ought to be met with official scrutiny and grassroots opposition. The point of the free-press protection that is outlined in the First Amendment is not to free billionaire media moguls and speculators to make more money. The point is to have a variety of voices, with multiple entry points for multiple points of view and a communications infrastructure that fosters debate, dissent and democratic discourse. That’s too much power for any one corporation to have, especially a corporation that has been on a buying spree. Comcast already controls NBCUniversal and a broadcast and cable empire that includes NBC, CNBC, MSNBC, the USA Network, Telemundo and various other networks. “In an already uncompetitive market with high prices that keep going up and up, a merger of the two biggest cable companies should be unthinkable. The deal would be a disaster for consumers and must be stopped,” says Craig Aaron, the president of the media-reform group Free Press. It’s bad for musicians, documentary makers and other creators. The idea that “all the avenues to truth” would be controlled by a monopoly, a duopoly or any small circle of multinational communications conglomerates is antithetical to the understanding of the authors of a free press, and of its true defenders across the centuries. The FCC, in particular, has broad authority to review telecommunications-industry mergers, with an eye toward determining whether they are in the public interest. And watchdog groups have been pressuring the commission’s new chairman, Tom Wheeler, to assert the FCC’s authority. For Wheeler, a former president of the National Cable and Telecommunications Association, the lobbying organization for the cable industry, this is will be a critical test of his leadership. But challenges to this proposed merger must also come from the anti-trust lawyers at the Department of Justice and the congressional watchdogs over consolidation and monopoly issues. “Stopping this kind of deal is exactly why we have antitrust laws,” says Free Press’s Aaron. The congressional role cannot be underestimated. The Department of Justice, the FTC and the FCC get cues from Congress. And the voices of members of the House and Senate will play a critical role in determining whether the merger goes forward. Some of the initial signals have been good. The ranking Republican on the committee, Utah Senator Mike Lee, supports the review, as do public interest groups ranging from Public Knowledge to Consumers Union. But hearings will not be enough. The Senate, in particular, must send clear signals. On Wednesday, a letter landed in my email inbox from Gregg Steinhafel, the chief executive of Target. He wanted me to know that there was a decent likelihood that some of my personal information had been stolen by criminals who had “forced their way into our systems,” as Steinhafel put it, and pulled off one of the biggest data breaches in history. I’m not a regular Target shopper, so I had to think about this for a minute. Then I remembered: In mid-December, while marooned in Houston after missing a connecting flight to Rio de Janeiro, I went to a Target store to buy some clean clothes. I paid with my debit card, which I swiped through the little “point of sale” machine, and then entered my passcode — something I probably do a dozen times a day. The very ordinariness of the transaction is partly why it hadn’t stood out in my memory. Since receiving Steinhafel’s letter, however, I’ve been brushing up on data breaches, and I’m here to say it is going to be a while before I’m sanguine when I make that little swiping motion with my debit card. In the battle between hackers and retailers, it sure looks as though the hackers are winning. If you have read anything about the Target data breach, you know that from Nov. 27 to mid-December, hackers siphoned off the credit card information of 40 million Target shoppers, including card numbers, passcodes and the three-digit security code on the back. They also took names and email addresses of tens of millions of other Target customers. Target acknowledged the breach on Dec. 19, but only after a reporter named Brian Krebs had broken the news on his authoritative blog, Krebs on Security. When I talked to Krebs, he told me that while Target was “hardly a poster boy for how to secure data,” the company probably wasn’t all that much worse than most other retailers. Its digital system undoubtedly had all the current antivirus software, none of which had detected the malicious software — “malware,” as it’s called — that had infected it. Krebs was pretty convinced that the hackers were Russians. It was obvious that they were extremely sophisticated in how they went about stealing credit card data. After burrowing into a Target server, he explained on his blog, the malware would then grab data from Target’s point-of-sale terminals all across the country shortly after customers swiped their cards. At that moment, a moment of maximum vulnerability since all the data was unencrypted at that point, the magnetic stripe would yield all the information the hacker needed. Virtually every security expert I spoke to said it is likely that a lot more retail companies have been breached than has been acknowledged. Indeed, last week, Neiman Marcus admitted that its systems had been breached. And just the other day, the Department of Homeland Security sent a report to retailers and banks warning about point-of-sale malware, which it suspects has infected more systems than just Target’s. The simplest thing we could do to diminish data breaches would be to move away from magnetic stripes, which are relatively easy to copy, and go to a system in which credit and debit cards are embedded with chips. In widespread use in Europe and elsewhere, such cards are practically nonexistent in the United States (though a rollout is supposed to begin in the fall of 2015). In 2009, a payment company called Heartland suffered a breach that was even larger than Target’s. You would think that would have been a wake-up call, but apparently it wasn’t. The most galling part of Steinhafel’s letter is its advice to consumers. “Never share information with anyone,” he writes. “Be wary of emails that ask for money.” None of this advice, of course, would have helped anyone who had the misfortune to shop at Target during the three weeks the malware was doing its devious work. The fault was not ours, Mr. Steinhafel; it was yours. As for me, it turns out that the Russian hackers won’t be able to use my debit card information after all. I had to get a new card — after I was hacked in Brazil. Visitors this weekend to Townhall.com were welcomed with a pop-up advertisement soliciting a petition against the Obama administration. 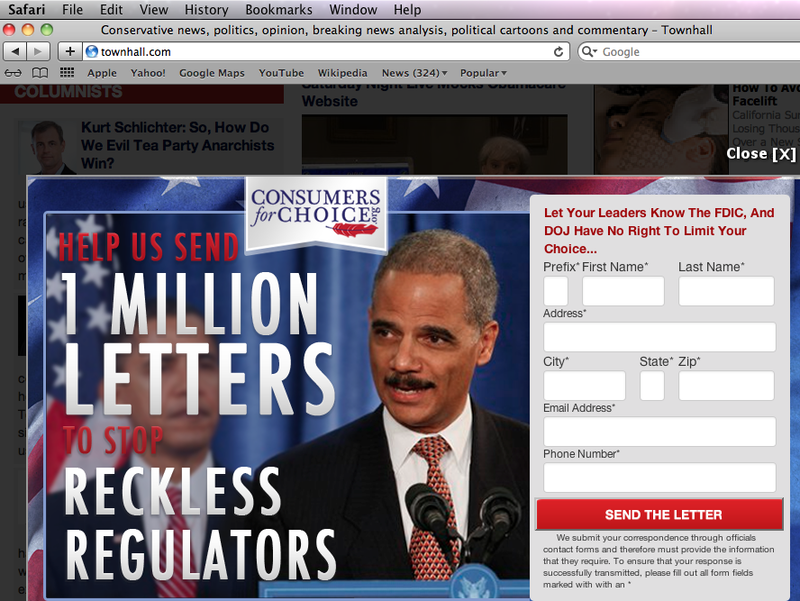 “Help us send 1 million letters to stop reckless regulators,” the ad beckons, atop images of President Barack Obama and Attorney General Eric Holder. The advertisement is sponsored by Consumers for Choices, a new group whipping up right-wing anger at the Obama administration for supposedly using his “Reckless, Elitist, Overzealous Regulators” to destroy “small-dollar” and tribal lenders. 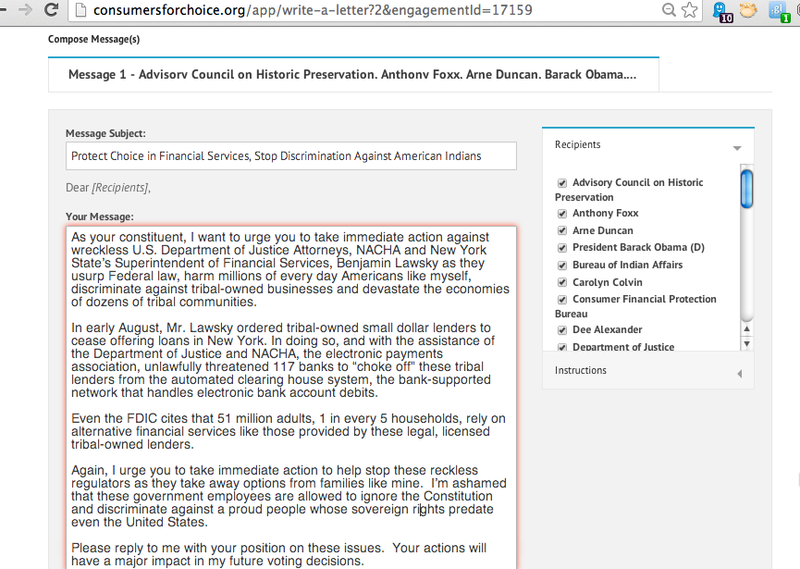 Visitors to the Consumers for Choices website, which is being advertised on conservative news portals like Townhall, are encouraged to contact their local representatives to send an angry pre-written letter. Consumers for Choices says their supporters will be automatically entered into a weekly raffle, with a grand prize $500 Visa gift card. The advocacy website repeatedly references Western Sky Financial, an online installment loan company that recently suspended lending after being sent cease-and-desist letters from government agencies. Left unsaid on the Consumers for Choices site are the types of loans offered by the company, which feature interest rates of 355 percent. A single $5,075 loan from Western Sky cost $40,872.72 to pay back—more than eight times the original amount. New York Attorney General Eric Schneiderman recently sued Western Sky Financial, CashCall Inc. and other online lenders for violating New York state usury laws, which cap interest at 16 percent for such loans. In August, the Department of Justice began investigating a broad range of banks that handle payments for payday and installment lending companies accused of deceiving customers and charging predatory interest rates. Regulators say predatory lenders are pairing to Native American groups to exploit tribal sovereignty. The Consumers for Choice site, registered in August shortly after the New York State and Department of Justice probe began, also does not disclose any information about who is behind the effort. The Contact Us page lists an address for Aristotle, a political website company. The only names listed on the site are Republican members of Congress who have issued supportive blurbs. “I applaud the efforts of Consumers for Choice to promote free market principals and help make the general public aware of how federal and state regulators are now working to limit consumers and small businesses ability to access consumer credit,” reads one message from Senator Jerry Moran (R-KS). Similar quotes are provided from Representatives Dennis Ross (R-FL), Dave Schweikert (R-AZ) and Tom Graves (R-GA). In August, thirty-one House Republicans signed a letter to the government, accusing the Department of Justice of “intimidating” banks for working with online lenders. A look into Florida state business records, where Consumers for Choices Inc. is registered, provides more clues. Asher is attorney with Jenkins Hill Consulting, a lobbying firm that represents a trade association for installment lenders called the American Financial Services Association. The group spends about $6 million a year, with a large portion of its budget devoted to advocacy and government relations. Last week, AFSA held its annual meeting at the Mandarin Oriental Hotel in Washington, DC, where member companies, along with their lobbyists, met with lawmakers and were treated to a private talk on “inside politics” by Fox News Sunday host Chris Wallace.